When five-year-old Julia Beckett first saw Greywethers, an old slate-roof farmhouse in Exbury, out-of-the-way English village, it was love at first sight. “That’s my house,” she told her brother Tom. Years later, she happened upon the house again and immediately bought it. Not long after moving in, she realizes that her instant feeling of ownership might not have been a presentiment about her future, but a memory from long past. She begins having flashbacks to the 17th century in which she remembers herself as a woman named Mariana who lived in Greywethers and fell in love with Richard de Mourney, the lord of the nearby manor. In the present, Julia is also forming a bond with Geoffrey de Mourney, the current owner of the manor house, as well as close friendships with Vivien, the owner of the local pub, and Iain, who tends the grounds of the manor. Their instant rapport feels to Julia like an echo of Mariana’s past friendships. Are the dead returning to Exbury? 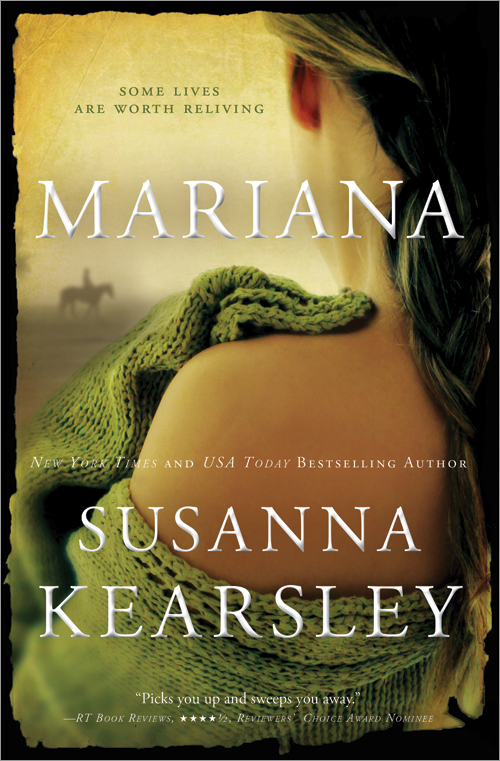 Mariana, one of Susanna Kearsley’s first novels, is being rereleased this week by Sourcebooks, and it’s a fine romance in the tradition of Mary Stewart and Daphne Du Maurier, but with perhaps a little more sweetness and a little less darkness than I expect from those authors. The trips to the past take place during the Restoration. Mariana has come to Exbury to escape the plague in London. She’s in the care of her uncle Jabez, a brutal and abusive man who allows her little freedom. As Julia continues to inhabit Mariana’s life, she comes to care deeply about Mariana and her companions, despite the danger her visits bring her. When she’s immersed in a flashback, she could wander anywhere that Mariana might have gone because she sees only what Mariana saw. Aside from the troubling flashbacks, which Julia gradually learns to control, Julia’s present-day life is almost wholly pleasant. Her friendships and family relationships are secure and happy, and she’s being successfully wooed by the swoon-worthy Geoff. (I did roll my eyes a bit when Julia literally did swoon upon first meeting him.) Everyone adores everyone else, and there’s always someone ready to sit down with a pint of beer or a cup of tea. It’s perhaps a little too perfect, and I didn’t exactly believe in Julia’s life, but it was fun to read about! This was my first time reading one of Kearsley’s novels, and Eva warned me that, being an early Kearsley, it’s not up to the same level as her later books. (Her favorites are The Rose Garden and Shadowy Horses.) If that’s the case, I’m definitely going to try more of her books because I had a lot of fun reading this—and the romance was stunning. Speaking of the romance, I’m dying to discuss it with someone who’s read it because OMG! I had a niggling itchy feeling about the direction the book was taking throughout, but I was fine with it. It was a happy enough story, even if it didn’t blow me away. And then it turned into something so perfect. Sappy as can be, but exactly what I wanted. But maybe cheating a little for dramatic effect? Not that I care if it was cheating because it made my inner romantic melt, and my inner romantic generally has a heart of stone. I’ll say no more, but if you’ve read it, let’s discuss in the comments. This entry was posted in Fiction, Speculative Fiction and tagged E-Galley, Revew Copy. Bookmark the permalink. You have made me very curious about this one. I’m not really into stories heavy in romance, but this sounds pretty awesome. I don’t read many books that are shelved in the romance section, but I enjoy a good love story now and then, and this is a good one. Okay, I’ve not read this and I don’t read that many romance novels but the premise is interesting. I love the issue of the perceived ‘reincarnation’ and all that. The reincarnation and time travel elements added a whole additional level of interest that I do think would appeal to people who don’t read much romance. Yours is the second review of this book for today! so many of her books around and all positive reviews. I never would have heard of her had it not been for bloggers loving her books so much! The time shifts were very well-done. The dialogue was just old-fashioned enough to make it feel real without actually being real. As for the ending, perhaps it will refresh your memory if I tell you that in the last chapter the romantic hero turns out to be a different man from the one the story has been pointing to. I could do with a good romance actually! It wasn’t what I felt I was in the market for, but now that you’ve described it so well, I think it could be just what I fancy. Even with the less-dark-more-sweet qualities. It was very sweet, but without being cloying. It’s nice to read something sweet sometimes, even though I rarely think it’s what I want. When I get it, I’m often so happy, and between this and the Heyer I read recently I must be in a sweet romance mood. I read this about a week and a half ago and am still trying to formulate my response. There were things about it I really enjoyed but I just didn’t click with any of the characters and really wasn’t buying into the depth of the soulmate bond between Mariana and Richard. I did, however, really enjoy the sappy ending, even though I was fairly confident from the moment he (won’t name names in fear of spoiling it for others) was introduced that he was going to be the man Julia ended up with. Honestly, if I hadn’t known that was where it was going I might not have finished the book. He had too many romantic cliches right from the start to simply be a supporting character (unlike Geoffrey, who was remarkably unmemorable). I liked Mariana well enough to pick up The Rose Garden, which I adored. I loved, loved, loved every moment of it. The characters and the plot are much stronger and I was completely swept away by it. I was genuinely surprised by the ending. I so often prefer the supporting male characters that I just assumed it was me. I did think she was making him too attractive overall, and Geoff was too “perfect on paper” but bland in personality, but I just shrugged my shoulders and moved on because I liked the story and the time travel elements. I do want to read more since you and Eva seem to like her other books more. Also, I like that Kearsley tries out different variations on her theme; for instance Rose Garden also has time travel but of a different form. And Winter Sea also has the whole ‘channeling a story from the past’ plotline but not the time travel. It’s really fun to watch her experiment. Named of the Dragon & Shadowy Horses are both different kinds of gentle, non-time-travelling paranormal stuff. I hope her other books are re-released soon, because I can’t ahold of them even through ILL! I’m so interested that you also weren’t surprised. I’m a little tone deaf, when it comes to romance, I think. Or maybe I’m less tone deaf than I think but just assume I’m getting it wrong, since in this case I did prefer the “right” man. My library only has a few of her books, so I may end up scrounging eventually, but maybe I’ll work through all the Stewarts and Du Mauriers first. I tend to always figure out the twist ahead of time (or killer, in case of mysteries), I’m not sure why! I think I figure it out about half the time. I don’t try too hard, though. Oh and I haven’t read House on the Strand. Just Rebecca, My Cousin Rachel, and some short stories.